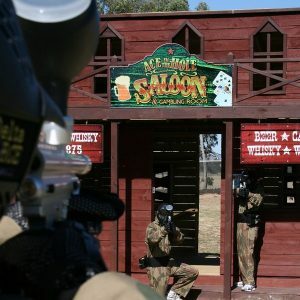 When you put together incredible movie-set props, the best equipment in the paintball industry and impeccable safety standards, it all add up to an action-packed day of paintballing at Sydney’s premier paintball centre. Delta Force Appin is located less than an hour from the CBD in an amazing outdoor setting. The thick and natural Australian bush provides the perfect backdrop for your day of paintball. Add to this Delta Force’s world-class facilities and you and your mates are set for what will be the highlight of the year. Who is the ultimate paintballer in your group? The one that can lead their team into battle, take charge when coming under heavy fire and has what it takes to bring victory to their team. There’s only one way to find out and that’s by visiting us in Appin. Our game zones are the ultimate in action paintball. 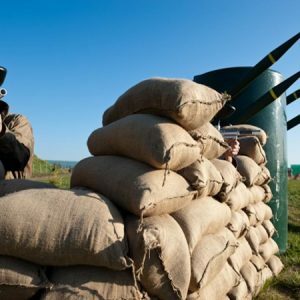 Whether they have been inspired by movies or historical events, our game zones will leave you breathless as you attempt to duck and weave the incoming paintballs and achieve the mission that was set by your leader. Attempt to capture the ancient idol from the giant pyramid, defeat the terrorists who are holding hostages on the London double-decker bus, and regain control of the prison from the dangerous inmates. You will experience all this plus more on your day out at Appin! To compliment our outstanding game zones you also need to have the best equipment. That’s why every player will be issued with a 0.68 calibre Inferno Paintball machine gun. The Inferno is a rapid, well-finished semi-automatic gun that allows all players to play with a fast-firing paintball marker that is lightweight and reliable during the heat of combat. The comfortable design means you can move around the fields to execute your strategy and easily pick off the enemy one-by-one. Whether you are a one-shot one-kill type of sniper or a shoot-at-everything-that-moves commando, we’re sure you’ll find that this gun will satisfy your paintball needs. From special birthday occasions to youth groups, and corporate events to buck’s/hen’s parties, come and experience all that Delta Force has to offer. It really is the ultimate adventure. Contact an event coordinator today on 1300 850 744 and we’ll get you booked in for a day of action-packed paintball with the world leader in paintball entertainment.